Brother Spellbinder veers off the beaten track with their unique blend of gypsy folk. 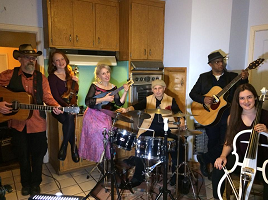 An inter-generational collective comprised of both core and rotating members, instrumentation includes cello, violin, ukulele, drums and guitar. Well-crafted songs, a dramatic flair and a pinch of mystery aim to enchant in an era of disenchantment. Lyrics flow from the uncensored mythical realm of the human psyche to the here and now of human experience. Each show is a unique experience leaving room for the unexpected with playful improvisation and a variety of textures. As the daughter of Dave Getz, original drummer for Big Brother & the Holding Co., Alzara was an early convert to the power of music. Her day job as a social worker and deep interest in how people heal is a source of inspiration for songwriting. After years of singing with a variety of bay area bands, she decided it was time to lead her own. She formed Brother Spellbinder with guitarist Jamie Wilson. Wilson was an early graduate from San Francisco’s School of the Arts High School and counters Alzara’s dulcet voice with a dollop of gristle in his vocals and a rhythm guitar that resonates with an earthy om. Two rotating cellists round out the lower registers with rich velvet tones: Rice masters graduate Gabriel Beistline, a regular with The Santa Rosa Symphony, Merced Symphony and others, and Helena Tietze, daughter of a choir director and organist, an accomplished pianist/keyboardist, and a singer/songwriter herself. The higher registers are shared by lead guitarist Sean Griffin with soulful and sensual riffs and violinist Steve Bollhoefer with playful and plaintive melodies. Drummer Steve La Porta steers the songs with creative marches, world beats and joyful vibrations.